for voice and electromagnetic tape. "I am sitting in a room different from the one you are in now. I am recording the sound of my speaking voice and I am going to play it back into the room again and again until the resonant frequencies of the room reinforce themselves so that any sem- blance of my speech, with perhaps the exception of rhythm, is destroyed. What you will hear, then, are the natural resonant frequencies of the room articulated by speech. I regard this activity not so much as a demonstration of a physi- cal fact, but more as a way to smooth out any irregularities my speech might have." Record your voice on tape through the microphone attached to tape re- corder #1. Rewind the tape to its beginning, transfer it to tape recorder #2, play it back into the room through the loudspeaker and record a second genera- tion of the original recorded statement through the microphone attached to tape recorder #1. Rewind the second generation to its beginning and splice it onto the end of the original recorded statement on tape recorder #2. Play the second generation only back into the room through the loud speakerand record a third generation of the original recorded statement through the microphone attached to tape recorder #1. All the generations spliced together in chronological order make a composition the length of which is determined by the length of original statement and the number of generations recorded. The versions in which one recorded statement is recycled through many rooms. Make versions using one or more speakers of different languages and in different rooms. Make versions that can be performed in real time. different from the one you are in now. are the natural resonant frequencies of the room articulated by speech. any irregularities my speech might have. "I am sitting in a room different from the one you are in now. I am recording the sound of my speaking voice and I am going to play it back into the room again and again until the resonant frequencies of the room reinforce themselves so that any semblance of my speech, with perhaps the exception of rhythm, is destroyed. What you will hear, then, are the natural resonant frequencies of the room articulated by speech. I regard this activity not so much as a demonstration of a physical fact, but, more as a way to smooth out any irregularities my speech might have." 1 The performer proceeds to carry out his task. We hear 32 repetitions of the text, and with each repetition the syllables are drawn out and resonated. By the end we cannot distinguish where one word ends and another begins; the text is completely unintelligible. What was once a familiar word has become a whistled three-note motif; what was once a simple declarative sentence has become a curiously tonal melodic fragment; what was once a paragraph of unaffected prose has become music. Somehow, somewhere in the course of 40 minutes the meaning of what we've been listening to has slipped from the domain of language to that of harmony. 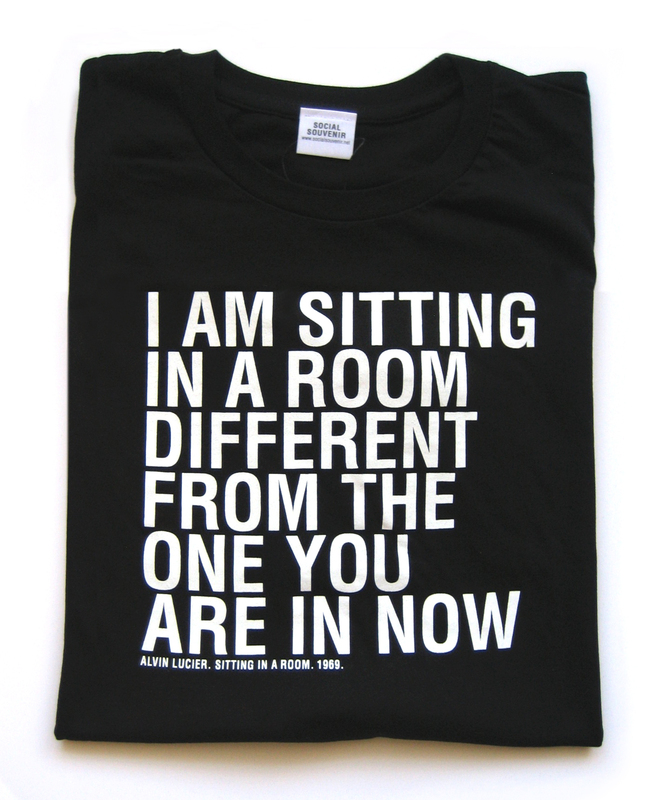 "l am sitting in a room" would seem to be a piece that needs no further explanation. It begins, after all, by stating in plain English exactly what is going to happen and why – a radical notion at the time (1969), and one that spawned a whole school of compositional activity in the United States and England. Using two tape recorders, a microphone, and a speaker, the performer recycles the recorded text in a room. The acoustical properties of the space transform the speech: frequencies resonant to the room are repeatedly reinforced, while the others are attenuated, until only the rhythm of the words remains recognizable as the driving force behind a pattern of ringing tones. 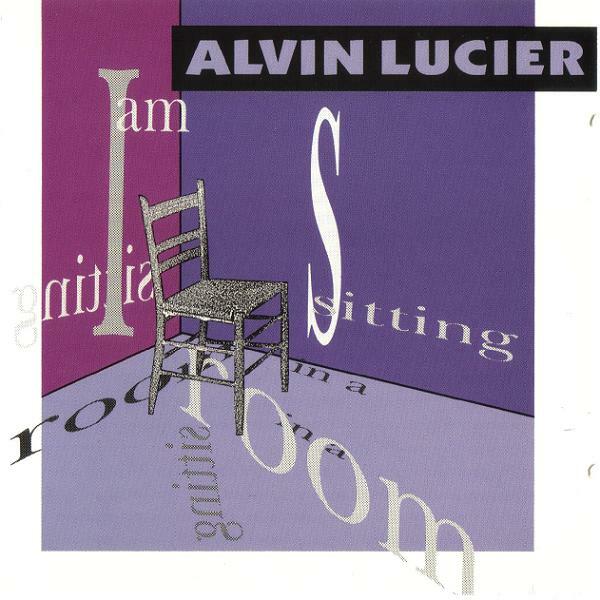 Alvin Lucier was probably the first composer to realize that an architectural space could be more than a supportive setting for musical instruments, that it could be an instrument itself. He was certainly the first to create a substantial body of work out of that realization. Before "l am sitting in a room," his "Chambers" (1968) asked performers to find ways of making sound with "bottles, cabins, wells, bells, capsules, craters, empty missiles," and 41 other hollow objects or "large and small resonant environments" seldom before thought of as instruments. 2 The performers in "Vespers" (1969) "pay their respects to all living creatures who inhabit dark places and ... have developed acuity in the art of echolocation." 3 Carrying special-purpose electronic circuits that emit sharp clicks, they use sound to extract information from the environment; their rhythms are not based on metric patterns, but on the demanding task of measuring and navigating the space.Lucier has often been described as a "phenomenological composer," but to do so strips his music of much of its richness. His work is "about" acoustical phenomena, but "Chambers" is as much about discovery and transformation, as Vespers is about social responsibility and survival, and as "l am sitting in a room" is about the subject, its narrator. By the end of the piece, with its magnificent ringing of architectural space, one sometimes forgets that it was a calm human voice that set the room into oscillation. As if viewing a slow-motion film of a flute player attacking a note, we experience the gradual buildup of energy as the instrument starts to sound, but here we begin not with a meaningless puff of air but with words. What we hear are not simply "the natural resonant frequencies of the room articulated by speech," but rather the intersection of one man's voice with his immediate environment; those whistling tones are neither just any nor all of the resonances, but only those that are shared by both the voice and the room.It is not surprising that Lucier chose speech as the source material for the piece. In an interview with Douglas Simon he says: "My first impulse was to use various musical instruments playing a wide variety of sounds, but I tossed out that idea because it felt too 'composerly.' Instead I decided to use speech; it's common to just about everybody and is a marvelous sound source. It has a reasonable frequency spectrum, noise, stops and starts, different dynamic levels, complex shapes. It's ideal for testing the resonant characteristics of a space because it puts so much in all at one time. It's also extremely personal." 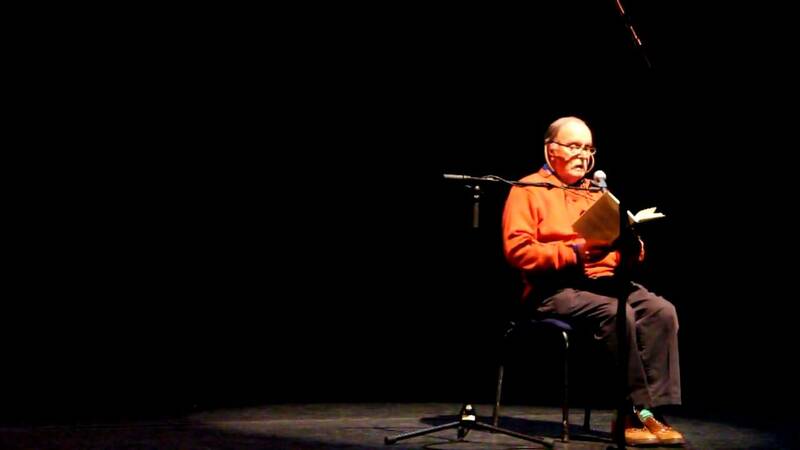 4 In Lucier's case it is all the more personal by virtue of his speech "impediment" – his stutter – which becomes the rhythmic signature of the piece. Mel Tillis, a fellow stutterer, claims to feel liberated by music because as long as he is singing to an even Nashville beat his stutter disappears. But Lucier, rather than seeking to erase in his music the stutter that impedes his conversation, uses this unique verbal drumming to propel the piece.Speech is the voice unbound, timbrely rich and thick with meaning. Song, on the other hand, forces the voice into narrow norms, stressing rules of tonality, rhythm, texture, and content that have little to do with any language. 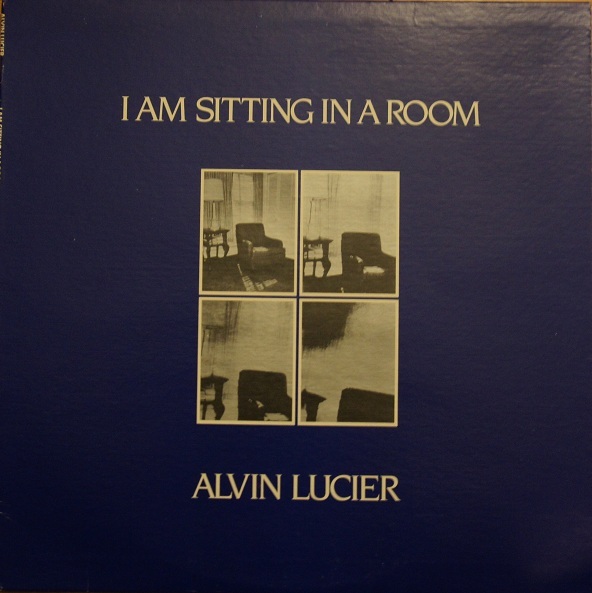 In "l am sitting in a room" Lucier frees the voice from the restraint of song and makes a truly new music firmly rooted in the power of speech – Sprechstimme seems by contrast mere lip service to the potential of spoken word as music. As he points out, speech makes good sense "scientifically," but more importantly it also transforms "a demonstration of a physical fact" into a very intimate performance. Lucier does not "smooth out any irregularities [his] speech might have," rather he elevates them to reveal a radical linkage between language and music.At the time of its composition, the only way to realize the score of "l am sitting in a room" was with tape: using two recorders the text was recycled and re-recorded, and then all the versions were spliced together chronologically. Concert performances consisted of playing back this composite tape, often in conjunction with a series of slides by Mary Lucier based on a related visual phenomenon. In the heyday of "Live Electronic Music" this seemed an anachronistic throwback to the tradition of studio-based tape composition. The pieces could have been performed live, with a very long tape loop (just as it could be accomplished today with digital delays or samplers), but to do so would have been to miss a subtle but important detail: "I am sitting in a room different from the one you are in now." Where "Vespers" mapped the performance space in the presence of the audience, "I am sitting in a room" brings another space into the concert hall; it brings the public into a private space.Lucier's first recording of the piece was made in the fall of 1969 in the Electronic Music Studio at Brandeis University during his last days teaching there; it was, in his own words, "harsh, strident."